Nation of Islam leader Minister Louis Farrakhan addressed a packed house at the Elmore Gym at Alabama A&M University tonight, concentrating on the topic “The True Meaning of Education,” but also acknowledging the controversy over his appearance and sprinkling in numerous comments and references to the Jewish community. Farrakhan was invited by the Alabama A&M Poetry Club and Alabama A&M Democrats. The university, as well as the state and local Democratic parties, distanced themselves from the visit. Many religious leaders in Huntsville decried the visit by the “divisive” leader, and a Facebook page opposing the visit was established yesterday, though there were only 18 “likes” as of tonight. The Birmingham Jewish Federation and Jewish Federation of Huntsville and North Alabama also launched an “Alabama Says No to Farrakhan” effort on Facebook. 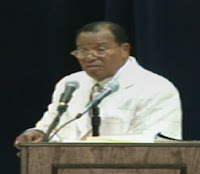 Those who were critical of the visit acknowledged Farrakhan’s right to free speech, their concern was over giving Farrakhan a forum for his views. He stated that blacks “get frightened when Jewish people” are critical of a black man. He then went into the current controversy over Florida Marlins coach Ozzie Guillen’s pro-Castro remarks, ascribing Jewish ties to it. The roots of the alleged Jewish hatred of Castro, he said, comes from the Talmud, which he said states that a Jew is not a real man until he owns property. “Don’t fault them, that is what they are taught,” Farrakhan said. He spoke of what Jews, Christians and Muslims claim to believe, then said “the hypocrisy in religion must end.” He told the students that if they truly knew Jesus, they would be “trying to get yourself together to meet him” and not succumb to worldly temptations.